The GoPro Fusion ships with an extendable selfie stick that doubles as a small tripod. GoPro may have jump started the action camera market, but the Fusion is different than all the GoPros that came before it: it's a true 360 camera. Instead of using a single forward-facing lens, its two ultra-wide angle lenses capture a full 360 spherical image of everything around it. Unlike most 360 cameras, the Fusion is designed to create both spherical and standard HD videos, potentially offering action camera users more capability than they can get from their current action camera – something that's become progressively difficult in a highly commoditized market. If action/adventure is your game and your workflow is geared towards mobile and web, the GoPro Fusion may be the camera you’re looking for. A view of the Fusion's twin offset lenses. What makes the Fusion most exciting, and what is arguably its main selling point, is 'OverCapture', a feature that allows you to pull standard 1080p HD videos from anywhere within the 360 sphere. This is an entirely different way of producing video content. Since you're capturing every single direction at once, you can frame your shot after you've shot it. 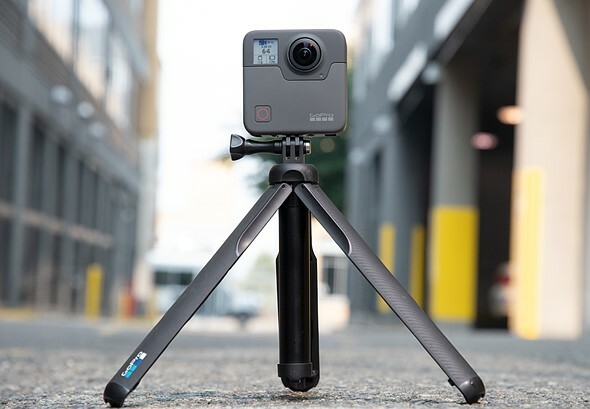 For an action camera user, this unshackles you from the confines of recording a single, unchanging perspective and opens the doors to generating complex camera moves for more compelling footage. OverCapture is an entirely different way of producing video content. You can frame your shot after you've shot it. Let's take a look at a real world example. To create the two videos below, I set the camera in the middle of a skate-park and asked Colin Flynn, founder of Fool’s Gold Surf, to skate around it. In the first video, you can drag around to see all the angles or, if you’re watching using a VR headset, you can just look around in any direction. This is an example of 360 video captured with the GoPro Fusion. You can drag around the image to look in different directions. The second video was created from the exact same camera footage, but using OverCapture to follow Colin's movement on the mobile app (literally by moving my phone around as if I was recording in real-time), then exported as a standard HD video. This video was created from the exact same clip as the one above, except that I used OverCapture to follow the action on my phone after the clip was recorded, then exported it as a standard HD video. You can do all of this - and share it - from the mobile app. You can do the same with the desktop software, though as we'll see, there are some glaring differences between the two and OverCapture does have its limitations. 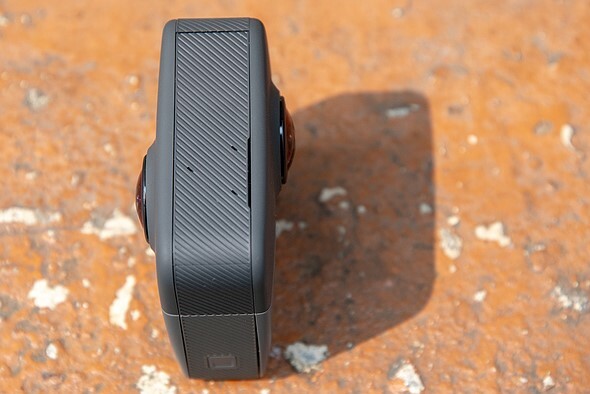 Despite being GoPro’s first foray into the 360 camera space, the Fusion gets a lot of things right and performs well. In fact, one important consideration when using OverCapture is that while the camera may be high resolution, you're exporting a 1920x1080 HD video (if shot on 5.2K), or 1280x720 HD video (if shot in 60fps 3K). Furthermore, if you zoom in, you’re losing more resolution relative to how much you’re punching in on that OverCapture frame, so if 4K is essential to your needs, or you’re interested in the Fusion primarily for action footage using OverCapture, those are things you might want to think about. Despite being GoPro’s first foray into the 360 camera space, the Fusion gets a lot of things right and performs well. The things it doesn't do well could, for the most part, be remedied by firmware and software updates, and we'll take a look at some of those things in the following pages.